Let's face it, the show is rather silly, the mythology overstuffed, but it has something about it that keeps you watching. 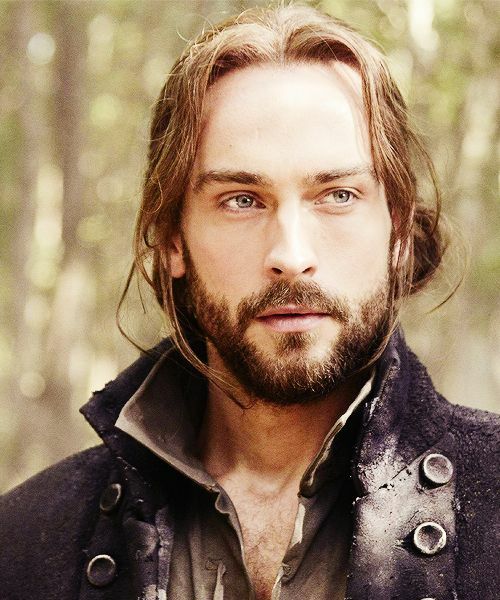 I have concluded for me that one thing is Tom Mison. He rises above the material and fills the screen with his melodious, cultured voice and tall, slim body. This man can act. It oozes out of his pours. He is really too good for this vehicle, but if this is what it takes to introduce him to North American audiences, it worked. The hubs is this close to dropping Sleepy Hollow. He says he can usually go with a program and accept its beyond reality core, he does enjoy Grimm and Supernatural to name a couple of fantasy/paranormal shows. But this one is losing his interest. Seeing the show has dropped quite a few viewers since its premiere, I asked him why? He does like Ichabod and his trying to fit into a new century, and since the hubs is a teacher, the historical flashbacks. (though they too, are not exactly factual) Its the plot in between that has his mind wandering during viewing. Each week brings a new layer to the puzzle, instead of resolving the ones they already introduced. Okay, I can see that. Also, I don't think he is sold on the whole 'ichabbie' dynamic. He likes the wife, lol~'Why isn't he trying to rescue the wife from Purgatory or where ever she is?' Good point. If it was explained, I must have missed it. She's dead, I get that. But this is a fantasy/paranormal show, she can come back, right? Or why have her in the story?